As overlanders, we often make a conscious decision to leave the comforts of pavement and seek out risky roads and trails. We spend hours pouring over maps, planning routes, addressing logistics – the least of which are water, fuel, food, shelter. We read trail reports and scour forums and buy more gear to make things either more doable or more comfortable. When the time comes we leave behind the pleasures of “civilized” life for the pleasures of a well-organized overlanding experience. Horatio Nelson Jackson did the same thing in 1903. However, this first great American road trip / expedition had a few differences in the planning stages. First, there were no maps of most of the territory between his San Francisco starting point and the finish line in New York City. Second, at the time he accepted the challenge, with a $50 wager ($1276.95 in 2013 dollars), he didn’t have a National Luna 12 volt fridge, Snow Peak cooking utensils, Camp Chef Everest 2-burner stove, ARB awning, or even… a vehicle. On May 18, he made the bet that he could cross the United States. Over the next 3 days, Jackson, age 31, did the following: He met 22 yr old bicycle racer, turned gas engine mechanic, Sewall Crocker, convinced him to join the expedition, purchased a slightly used 1903 Winton automobile because of Crocker’s recommendation (named “Vermont”), continued to learn how to drive, and on May 23rd, 4 days after taking the bet, left San Francisco for the east coast. When Ricardo Gonzalez of Caribbean Rovers (www.caribbeanrovers.com) and I were guiding tours in Puerto Rico, we had a finely tuned collection of gear packed in to his Land Rover Defender 110 and D-90. He knew the richest places on the island to explore, and as the owner of a Rover mechanic shop, our trucks were always in perfect condition. I spent time putting together purchase orders for camp tables, chairs, cutlery, tablecloths, bedding, etc, to make sure our clients (and we, on the off-days) could camp in comfortable, semi-luxurious Caribbean style. We also worked on logistics. You don’t just take a group of 6 – 8 high-end clients out across a tropical island to explore it’s greatest beauty and not pay attention to where the decent and timely bathrooms are. And how far along are you going to be before the clients will want a mid-morning snack? Where is the best place to stop and set up tables (with table cloths) and slice European cheeses on a butcher block cutting board, beneath a vehicle-attached beachfront awning? These questions, and their answers, are important to a well-planned, incident-free, overland experience, right? 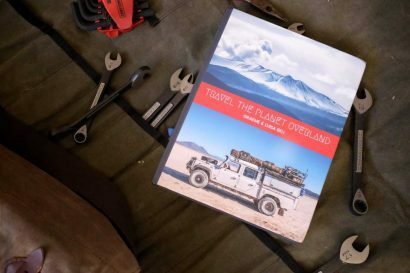 I know, in the every day world of overlanding, we make the greatest of plans, organize our always-lacking-something gear, and despite our efforts, something day-changing, or trip-changing, goes terribly wrong. And these are planned routes with GPS coordinates and backup relief maps, tuned vehicles, plenty of excess gasoline, water, air tools, and miscellaneous gear. By our standards of preparedness, this Horatio Nelson Jackson fellow was not someone you’d want in your convoy of rigs over unknown, wild terrain. He was a doctor in Burlington, Vermont. He had no idea what an expedition across the United States would entail, and therefore, had no idea how to plan for what was to come. Boldly, with a little bit of gear, he and Crocker simply climbed in to the car, put on their driving goggles, and went on their way. . . qué será. Imagine going cross-county in a time when there were only 150 miles of paved road in the United States. 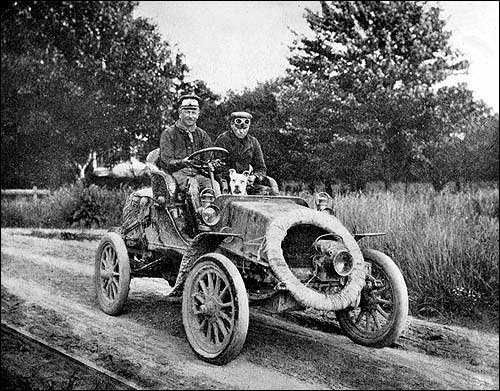 Most Americans hadn’t seen the “horseless carriage” at this point, and most “roads” were more like muddy trails used by horses and wagons. Imagine blowing out all of your tires and being so far away from anything remotely worthy of replacing them that you opted to put rope around your rims. Imagine driving a day’s route over rough terrain in what was truly the middle of nowhere and realizing that your cooking gear (pots, pans, utensils, all) had fallen off your pack along the way. Jackson and Crocker determined that, “… living off the countryside, or starving, was less to be feared than a return trip.” -Ralph Nading Hill, The Mad Doctor’s Drive. 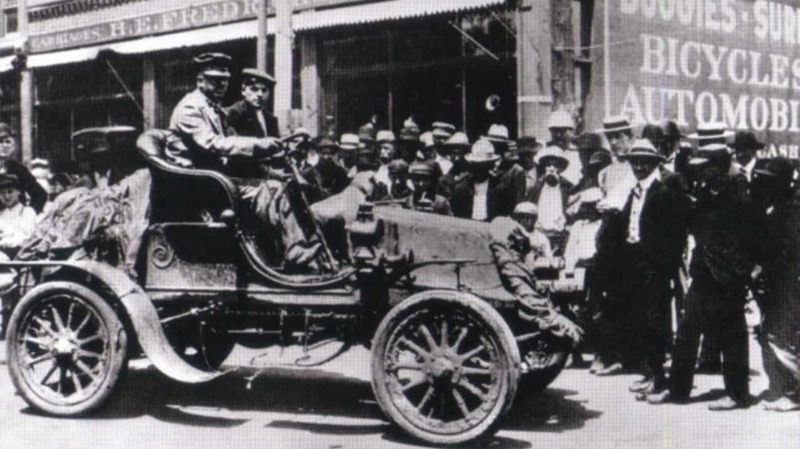 Imagine being in such a unique vehicle that more than once, when asking for directions, the people would send you some 60 miles out of your way over terrible trails so that their relatives could see for their first time a “horseless carriage” (also known as a Devil Machine). “The worst is over now,” the optimistic Jackson wrote to his wife on several postcards along the way. And yet, along the 63 day trip to New York, “the worst” came up again and again and again. 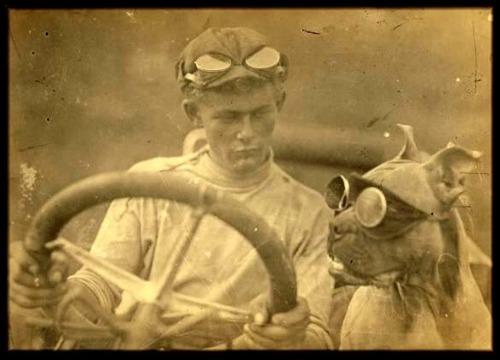 We softies and weekend warriors, over 100 years later, don’t have the unexplored land or the lack of facilities to experience the type of “worsts” that Horatio Nelson Jackson, Sewall Crocker and Bud, their canine companion, encountered. Jackson left behind a legacy of improvisation, enthusiasm and optimism. It’s our duty to ourselves and to our fellow overlanders to carry the torch of Jackson’s spirit. 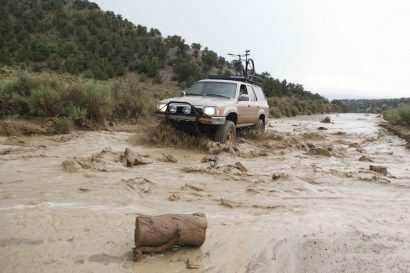 Whatever comes up, we owe this first champion of “automobiling” and “transcontinenaling,” as some called it, an attitude of positivity in what seem to be our darkest overlanding times. Around our next campfire, whether we’re set up at the pre-planned, mapped out camp site beneath a full moon, or 50 miles short in the middle of a muddy, rocky forest trail during a thunder storm, we should should open that 12-volt fridge, pull out something cold (almost frozen, really) to drink, and pour a little on the ground in memory of Jackson’s spirit. This simple act of optimism will help wipe away the memories of that day’s struggles. We’ll face the next day’s struggles soon enough, to be sure. But at least we could confidently say, for a short time, the worst is over now.